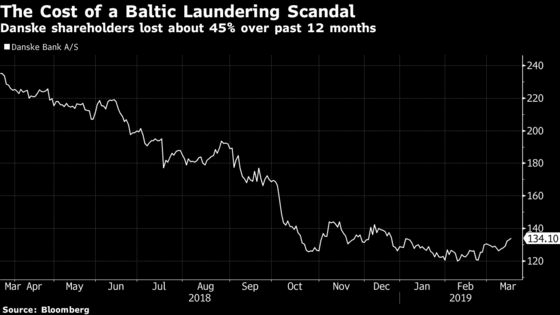 (Bloomberg) -- It seems increasingly clear that Danske Bank A/S was far from alone in its involvement in one of the world’s biggest money laundering scandals. In the Nordic region, allegations of money laundering have also hit Swedbank AB and Nordea Bank Abp. Bill Browder, the Hermitage Capital Management co-founder who has brought criminal charges against all three banks, says the Danske case may represent just a quarter of the total illicit flows from Russia into the West. Dybvad says there are still unanswered questions as to where the dirty money ended up. “We’ll see what will happen in the future about that,” he said. Danske, which faced shareholders for its annual general meeting on Monday, is still dealing with the fallout of its money laundering case. The bank is the target of criminal investigations in the U.S. and across Europe, and has purged large chunks of its upper ranks in response to the scandal. 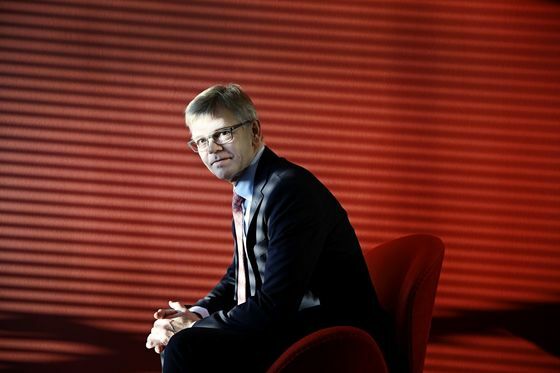 Dybvad started in December after his predecessor, Ole Andersen, stepped down amid a public backlash against the bank. Among those also to be removed last year was the chief executive officer, Thomas Borgen. He’s been replaced on an interim basis, but the bank is still struggling to find a long-term successor. Half a year after Borgen’s exit, Dybvad said he doesn’t want to set any deadline on how long the process might take. Dybvad also indicated that the bank doesn’t have that many options, when it comes to finding the right candidate to be Danske’s CEO. Danske’s management and board are trying to restore confidence in the bank as it faces criminal investigations over claims that it became a central causeway in Europe for former Soviet money launderers to channel their funds into the West until as recently as 2015. Investors are now bracing for fines potentially in the billions of dollars, as they come to terms with the likely consequences of Danske’s failures. Dybvad said the bank still doesn’t have any estimate for how big a fine it may have to pay. He also made clear that the bank’s executive board agreed not to have its bonuses paid out for 2018, given the ongoing dirty money case. Previous efforts to replace Borgen failed after Danske’s board tried to propose the bank’s head of wealth management, Jacob Aarup-Andersen, for the CEO role. The 41-year-old was rejected by the financial regulator for lacking the relevant experience. The bank has been run by Jesper Nielsen since October, who has taken on the CEO role on an interim basis only. He’s head of Danske’s Danish banking operations. Danske went through one of its worst years in 2018, leaving employees struggling to take any pride in their work, according to the chairman. Speaking to shareholders, Dybvad described last year as a “low point” in the history of Denmark’s biggest bank. He also said he’ll do everything in his power to “exploit all available options” to claw back bonuses to a number of senior staff in Estonia and Denmark, as criminal investigations continue. Denmark’s Shareholders’ Association said it welcomed the stance. Meanwhile, there are signs that the laundering case hasn’t severely impacted Danske’s business. According to Claus Wiinblad, head of equities at shareholder ATP, the core operations remain “robust,” even though funding costs have risen amid concerns over potential fines. According to Bloomberg Intelligence, Danske may be facing total fines between $2 billion and $2.5 billion for its money laundering scandal. That should be manageable for the bank, given it has a common equity Tier 1 buffer -- a measure of capital -- of more than $6 billion, Bloomberg Intelligence analysts Philip Richards, Jonathan Tyce and Elliott Stein said on Monday.